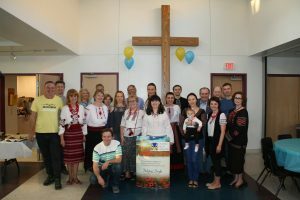 A charitable Ukrainian dinner/fundraiser to benefit wounded Ukrainian warriors was held on May 7 in the Centerville United Methodist Church. Ukrainians and Americans gathered together to enjoy homemade Ukrainian dishes, listen to Ukrainian music, and saw a borscht cooking demonstration. We are greateful to Centreville United Methodist Church for hosting this fundraiser for the third time – first one was in 2015. A special thank you to the organizer of the event, our tireless Tamara Rudolph, and all volunteers who helped by cooking and serving the best Ukrainian dishes. Our big thank you to all who donated! We collected $1950 in donations including $150 from sales of the beautiful pottery donated by ceramic artists from Michigan (Thank you Irina Bondarenko for partnership). A heartfelt thank you to the Michigan artists for donating beautiful ceramics! Also thank you to our local artist Ірина Шаменко for donating her art for sale and volunteering at the event. Proceeds from the event will be used to buy a respiratory ventilator for an ambulance working on the front line in Donetsk region. This entry was posted in Fund Raising, Humanitarian Aid and tagged ceramics, fundraising, hospitals. Bookmark the permalink.